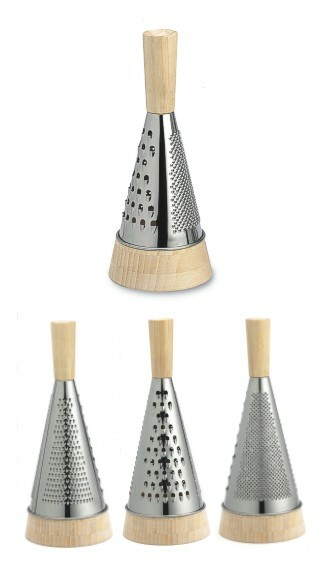 Striking and unusual, the iconic design of this grater, from Legnoart, is not only beautiful to look at but is also very practical. The base is made from solid natural side compressed bamboo with a wholly natural waterbase finish and acts as a utility bowl. While the conical triple function blade or grater, has the advantage of being at the correct angle for grating, with the removable single handle giving effortless stabilty to the unit. This design masterpiece is 28 cm high by 12½ cm in diameter (11 by 5 inches approx), it is also refrigerator safe.